I had a case of the Mondays yesterday and this week so far after work stress and a Griswold Christmas tree story that I can laugh about now, but wasn’t when I was lugging a huge boxed Christmas tree out of my car and into a home improvement store last night. I’m a fan of real Christmas trees, but not so much of stuffing one into my car. So we decided to try ordering one online for home delivery from said large home improvement store chain. It wasn’t expensive, delivery was available in our neighborhood, and our delivery date was supposed to be the first weekend of December – perfect. Towards the end of our delivery window, the order was still showing processing online without a delivery date. So I called customer service, they could not confirm if and when the tree would be delivered so we cancelled the order and picked up a tree locally. Last night, over a week after our delivery window, a massive box was delivered because the order was apparently not cancelled and the tree was actually shipped ground across the country instead of being delivered from the local store. What?! And I could not get a refund for it until it was shipped back or returned to a local store. So in the cold and dark last night, we stuffed a 7+ ft. box into my little car to return it. My efforts to avoid stuffing one Christmas tree in my car resulted in stuffing two! Ha ha … ugh. 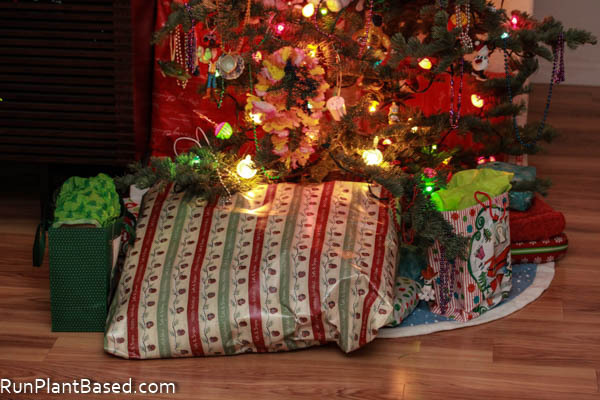 But presents are wrapped and ready under our first tree. And I kept it simple and comforting for dinner last night after a crazy day. 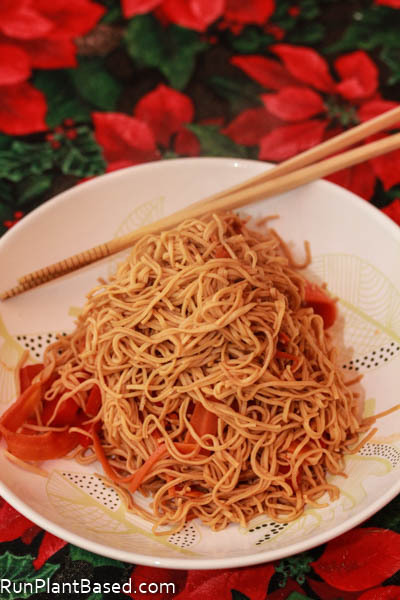 Amazon has Explore Asian Soybean Spaghetti back in stock for a reasonable subscribe and save price for a pack of 6. 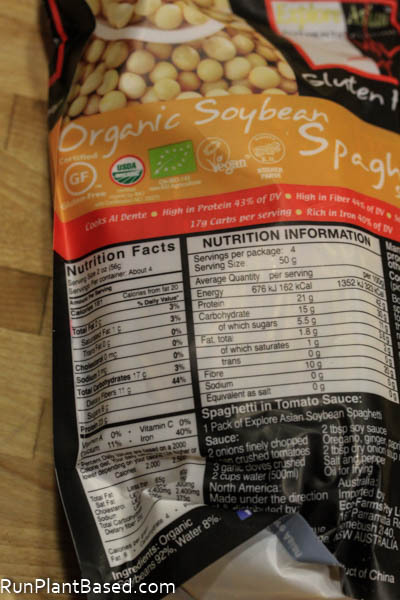 This stuff is vegan happy pasta because it’s loaded with 23 grams of protein per serving, but is lower calorie and easier to cook than traditional pasta. Also organic, gluten free, non-GMO, high fiber … buy it for your pantry! 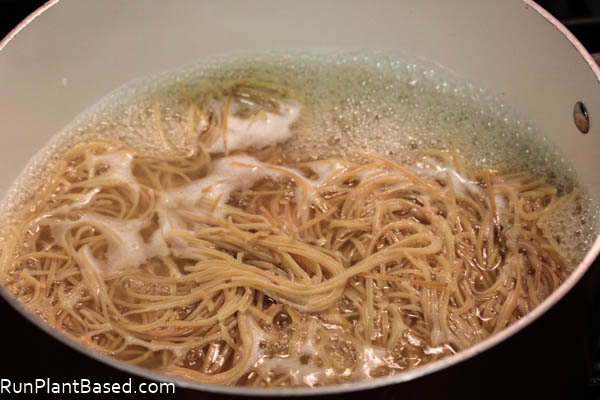 The spaghetti cooks like traditional pasta in boiling water, but faster and in less water. 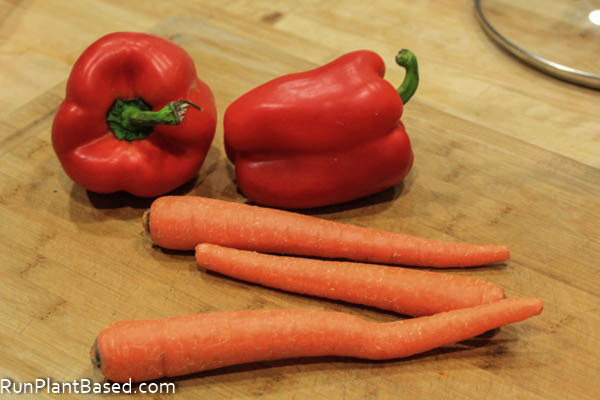 I grabbed red bell peppers and carrots to saute the cooked spaghetti with in a wok. 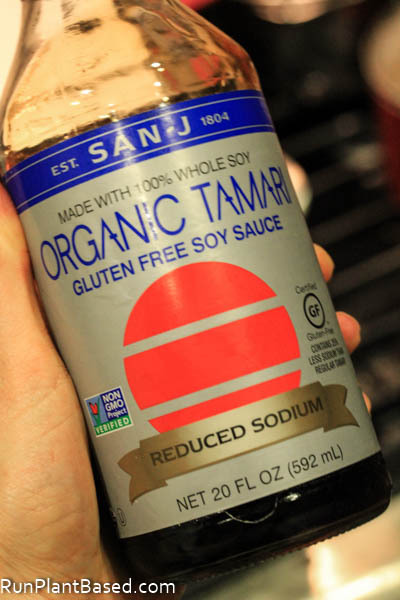 And added San J Organic Tamari. 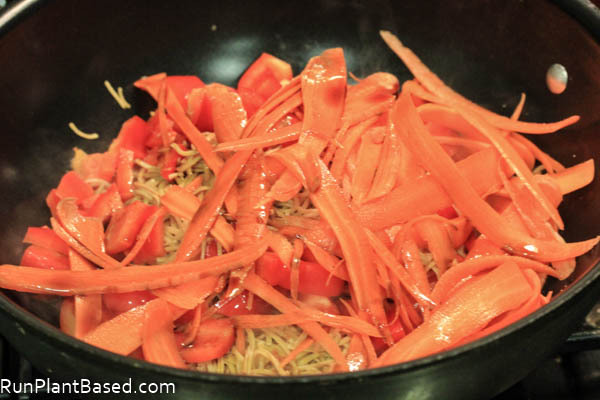 For a simple and fun protein pasta stir fry without oil. 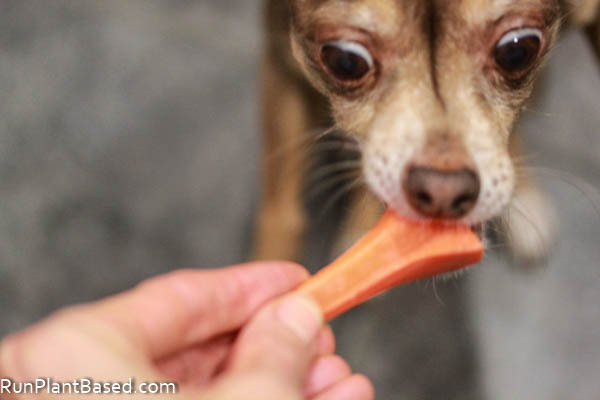 Had to share the carrot scraps of course. And enjoy a hearty, fun, and comforting dinner after a wacky day. The texture of the spaghetti is a little more chewy than traditional pasta, but still pasta like to me and great at absorbing sauce flavors. Miko could not understand why I wouldn’t share more with him. 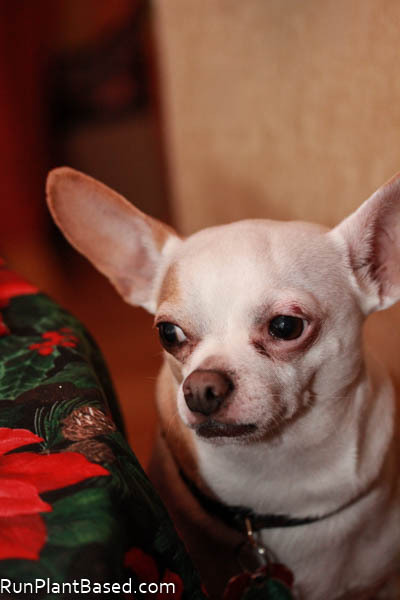 I tried to explain Sriracha is not great for chihuahuas, but he pouted. You won’t with this satisfying spaghetti, the simple one-pot meal possibilities are plentiful including Trader Joe’s organic vegan marina sauce and added spinach, curry paste and coconut milk, etc. That’s tough, been there and everything looks good! Okay, I want to get my hands on some of that pasta!! I totally feel like I need more protein right now with all the stress. Your tree is lovely. Nice ornaments!! Thanks and you should, it’s very tasty and hearty! 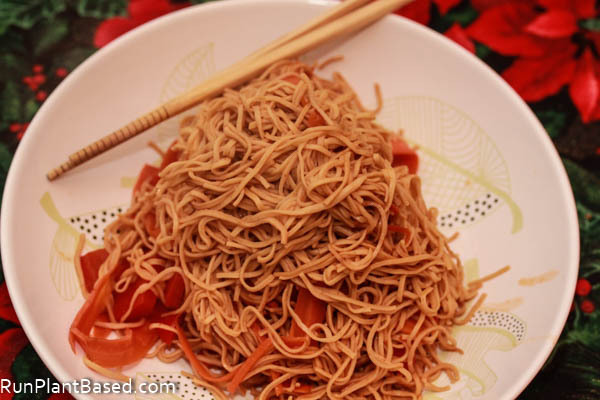 The company also makes mung been and black bean pasta that’s high protein. Oh my gosh, that’s annoying! If you were as self-punishing as I am you would have found a place for the second tree and called it a day. I keep trying not to think about putting my trees away after the holidays. So much work! That pasta looks so good. 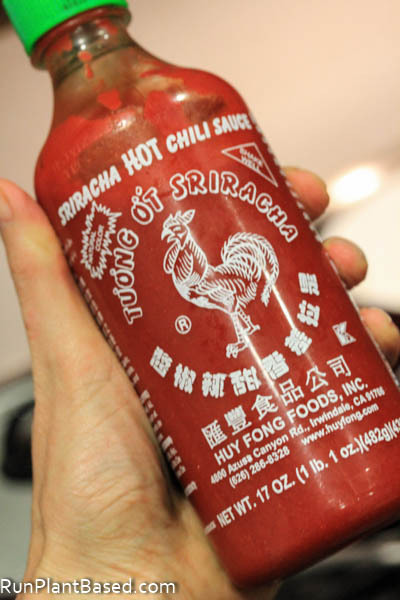 I love sriracha in anything, but I’ve never put it in pasta. Thanks for the great idea. It was tempting on the tree, but we do not have room for two! 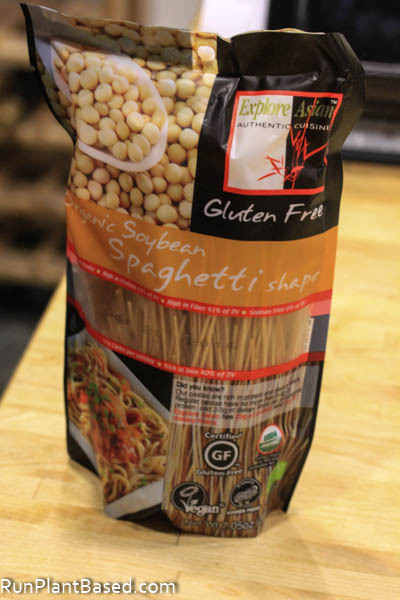 Thanks on the pasta, it’s a great pantry staple and they make other varieties too such as black bean and mung bean!